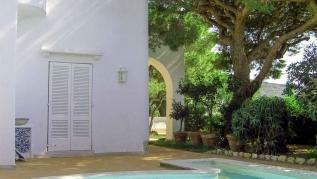 Distant from the bustle of the more popular sites on the Island of Capri, Villa Venere is strategically positioned on the street that leads from Anacapri to the renowned Blue Grotto. 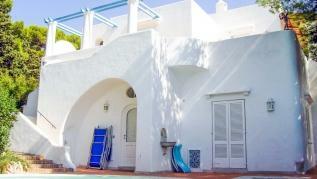 Guests can enjoy breathtaking views of the Island of Ischia and the Mediterranean Sea. Venere was built by a German aristocrat and dedicated to his wife, a descendant of the Italian Royal Family. 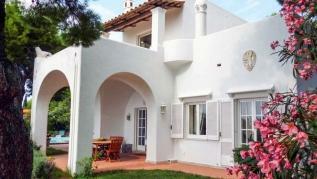 Three bedrooms have A/C units, and all bathrooms are provided with hairdryers. The interior décor is classic, uncluttered, elegant and sophisticated. 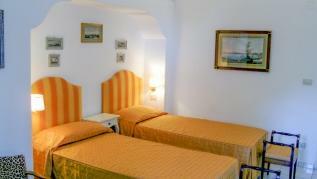 Rooms are decorated in typical Caprese style and include local renown Vietri tiles and white-washed walls. Ground Floor: Beautiful and bright living room with decorative fireplace. 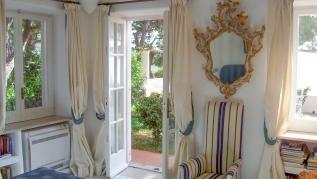 This room opens to a patio furnished for dining al-fresco. 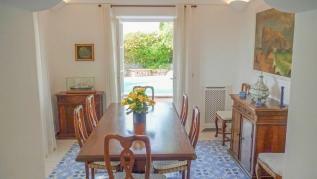 Lovely dining room with direct access to the pool area. 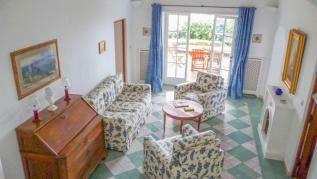 Brand-new fully-equipped eat-in kitchen with mosaic tiles and marble counter. 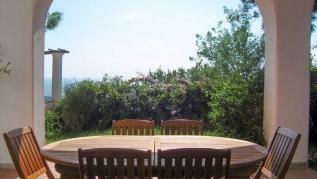 First Floor: Additional sitting/TV room that opens to a terrace with stunning sea views. Private circular swimming pool (6 x 1.80 cm) with furnished pool deck, 1000 sqm garden with covered areas for outdoor dining, panoramic porch with built-in seating, and balconies with outdoor furniture. Stunning sea views. 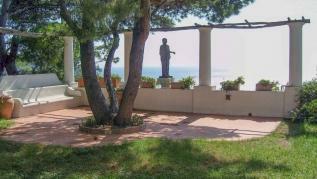 Bronze and marble statues are featured in different areas of the property. Private parking for up to to cars. Capri is only 10 minutes away by car. 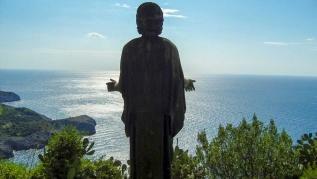 Bus stop for the Blue Grotto (5 min) and Anacapri (5 min) just in front of the villa gate. Rent a boat through our complimentary concierge service to visit the marvelous Capris coast and the nearby Amalfi Coast. 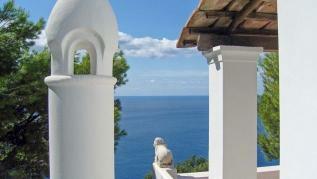 Excursions to the Roman ruins of Villa Iovis in Capri can be arranged, among others. An intriguing island in the Bay of Naples, Capri has been coveted since Caesar Augustus purchased it in 29 B.C.. Capri's steep walled harbors are filled with an impressive array of yachts, and fantastic beaches abound. There's always a flurry of activity in Capri's main square, La Piazzetta. Elegant shopping awaits along Via Camerelle, where boutiques are built right into the original Roman walls. Have a cappuccino with a cornetto at Tiberio caffé, or a Campari aperitif at the bar of the Quisisana Hotel. Take a stroll on Via Krupp, one of the world's most beautiful pathways that corkscrews down to the beaches below. Or rent a Riva (an Italian motorboat) or one of the typical Caprese boats (gozzi) and head to the Faraglioni, the iconic monolithic rocks rising from the sea, or indulge in an excursion to the Blue Grotto (better during off hours). Visit Mount Solaro, the highest peak on the island (589 meters above sea level), which is 12 minutes by chairlift from Piazza Vittoria or about 1 hour on foot. If you want to glimpse at Capri in all its natural glory, Mount Solaro is an absolute must. Seemingly untouched by time, this peaceful corner offers refuge from the crowds of jostling tourists. 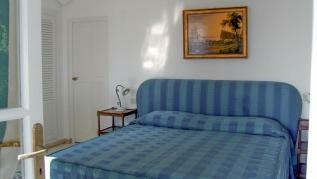 Considering that Capri is a mere four miles in length, it is rich with historical sites. Tour the Villa San Michele in Anacapri, a museum with splendid mosaic floors and filled with Roman artifacts. Most spectacular of all are the Gardens of Caesar Augustus. Be sure to walk along ancient footpaths above the sea - one can't help but be swept up by the soul of Capri. JKitchen at the hotel JKPlace in Capri – Sophisticated elegant restaurant with fantastic Mediterranean food, great views from the panoramic terrace, and chic atmosphere. Il Riccio – Michelin starred restaurant in Anacapri. We suggest trying pasta with seafood and the Mediterranean crudo. Trattoria Il Solitario – When you want to escape the crowd of Capri, head to Anacapri where you can find this lovely and informal venue with great local food. Le Grottelle – With a balcony overlooking the Arco Naturale, this is the place to enjoy the view, while sampling simple island's cuisine: zucchini scapece style, Capri ravioli stuffed with ricotta cheese, fried fish and pastiera, the typical local dessert. La Fontelina – Choose this spot if you want to be in the fanciest beach club on the island to enjoy people-watching, and great food. Limoncello – no look further! Buy it at Limoncello di Capri. Hand-made sandals – For your pair of beautifully handcrafted sandals head to the concept store Mariorita, in front of Capri Palace. Perfumes - Carthusia, the original perfumes of Capri. Jewelry - Grazia & Marica Vozza, unique caprese creations using, among other materials, semiprecious stones and Fresh Water baroque pearls. The work of these two artisan twin sisters is gaining international favor among the fashionistas.